Salads are a terrific way to make vegetables your main course. When Martha invites guests to lunch, she loves to make Frisée aux Lardons, a classic French salad made with spicy greens, crisp bacon, creamy poached eggs and warm vinaigrette. 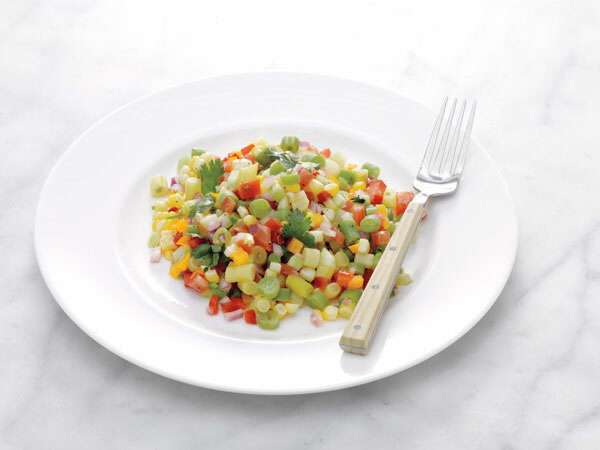 Her Chopped Salad is based on a recipe she got from her daughter Alexis — a dish that’s as beautiful in presentation as it is delicious in taste. Next Martha shows you how to master the Caesar Salad, and then, Stacked Butter Lettuce with a fresh citrus and yuzu vinaigrette. Martha makes croutons by slicing bread into half inch pieces and heating them in a skillet on top of the stove. This caesar salad recipe appears in the "Salads" episode of Martha Stewart's Cooking School. In a large skillet, heat oil and butter over medium heat until the butter has melted. Add bread cubes, salt and pepper, and toss to coat. Cook until golden. Remove from skillet and set aside. Place the garlic, anchovy fillets, and salt in a large wooden salad bowl. Using two dinner forks, mash to form a paste. Using one fork, whisk in the lemon juice, pepper, Worcestershire sauce, mustard, and egg yolk. While whisking, drizzle in the olive oil and continue to whisk until emulsified. Add 1 cup grated cheese; set aside. Cut the lettuce into 1 to 1 ½-inch pieces, add to the bowl along with the croutons, and toss well. If desired, garnish with additional cheese. Serve immediately.